Auto accidents happen every day in New Jersey and are a common cause of property damage, physical injuries and death. If you have been involved in a car accident, you may be entitled to receive compensation for your damaged property and for any other harm that the accident caused. Compensation generally includes payment of medical bills and lost wages plus compensation for other damages like pain and suffering. This compensation may come from your own insurer or from the driver who was responsible for the accident, depending on the circumstances of the incident and the law where you live. These factors and the extent of your injuries and damages will also influence the amount of car accident compensation available. While auto accidents make up a significant portion of personal injury and wrongful death claims, they cannot be considered routine. Each accident must be investigated individually to establish case specifics. Our experience in New Jersey auto accident litigation is extensive. The team of auto accident attorneys at the Clark Law Firm PC are adept at assessing the physical principles of the accident, the medical evidence used to evaluate injuries, and the economic and accounting principles required to evaluate losses. We provide the strongest possible representation. Victims of automobile accidents are entitled to compensation for property damage, medical bills, lost wages, pain and suffering, and for permanent injury or disfigurement. Please be aware that insurance adjusters and investigators or representative may try to take advantage of victims who are not represented by an attorney experienced in motor vehicle accident cases. Unfortunately, automobile accidents are an everyday occurrence in New Jersey. Most personal injury claims in NJ are a result of an accident involving a car, truck, or other motor vehicle. Many of these accidents result in minor vehicle damage in the form of a “fender bender,” and can the property damage claim may be able to be resolved through the insurance company. However, car crashes that involve physical injury, fatality, or other significant damage may warrant the legal representation of an experienced auto accident attorney. 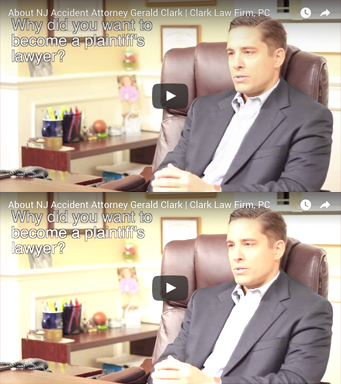 The experienced car accident lawyers at the Clark Law Firm, PC can help you get compensation to cover any losses incurred due to the accident, such as medical expenses, lost wages, and car repairs. In some states, a car accident lawyer may help you recover when a loved one is killed, especially if reckless driving, speeding, or drunk driving was involved. Do I Have to File a Lawsuit to Resolve My Case?